It’s been beautiful here the last week or so! Over 70F in the heat of the day, plenty of sun. Time to get serious about summer projects. I really should have figured and ordered all my supplies to insulate and reside the house weeks ago, so I could get started now, but I always underestimate how big a project the shopping part is! The overall plan is to finish insulating the exterior of my not-so-well insulated-for-Anchorage 2×4 construction ecoplex. Last summer we dug 4′ down and 4′ out around the basement and insulated the concrete block foundation/basement with 4″ of exterior styrofoam. There is about 4′ above ground that I really need to flash and coat with a protective layer of something, and I have been agonizing about the right product to coat it with. You can search posts from last summer to see lots of pictures and get details of that big project! This summer I want to remove the windows on the north side of the house (replacing the living room picture window with a couple little peeker windows instead), rip off the siding, put on 4″ of blueboard foam insulation around the whole house, and reside with hardie fiber cement lap siding. The windows will all need to be reset in the new wall thickness, so I am taking the opportunity to replace two old single pane windows as well, although swapping out windows is not very cost effective, comparatively, for me. I will also throw another layer of fiberglass in the attic, because although I already have a foot of fiberglass in there, another 4″ or so (~R-13) is economically justifiable. I have spent some time on websites and calling folks to find people that carry what I need, and I still haven’t figured out my definitive window source yet. I called Aurora, and I may go that route, but I’m not sure if I want wood frame windows (which they have). I know I don’t want vinyl or aluminum. I’m pretty sure I want fiberglass due to its durability and thermal properties. I’ve emailed a manufacturer in Fairbanks and am waiting to hear a quote. Anyone know a distributor of energy efficient, fiberglass windows in Anchorage? What I have had luck with is the insulation and siding materials. Searching the websites I had determined that it was hard, right now, to find the smooth hardie fiber-cement lap siding that I had decided on – everyone seemed to only have the ugly wood print (instead of smooth) in stock. Part of me really wants to shop at Spenard Builders Supply – the local building supply place – but they are just so much more expensive for the same thing. I don’t know what to do about that. It turned out they could get me the siding I wanted, but I knew I might be able to do it cheaper at a box store. I prefer the blue big box store over the orange one. So I called up Lowes to see if they could get it here, along with other stuff I needed but the website didn’t show them as having. I tried to reach the building material department, but no one ever picked up, so in desperation I hit the number for the commercial sales department. Best thing I’ve done in a while. Right away this very helpful guy, Levi, picked up. He wasn’t sure he could get the smooth lap, it certainly wasn’t showing up as available to him either, but he went to do some checking. A few phone calls later and I am all set up with an account with them and pretty much all I need to have delivered, including a product to coat my foundation insulation!! There were deals and sales and he really did some work to find and order me products and get me what I needed at a good price. Sheesh – now I sound like an ad. Well, I just had a good experience, and feel like I didn’t just spend all my project money before the project is done, but please, still try to source things used or local or green as you can. I have the constraint of living way the heck up in Alaska and needed to finish my project by September to get my home energy rebate, so I’ve justified buying new stuff from the big box because insulating my home is a good thing. 5 pails of Styro Tuff II trowel-on foundation/foam insulation coating + the sticky mesh needed to bond it to the foam board (see the manufactures website for info). It comes in colors! I chose ‘wheaton’ – at no extra cost. I still need fasteners and paints/stains for the project, as well as flashing and trim, but I think I can find most of that locally and shove it in the back of G’s station wagon or a work truck. And the windows – gotta get that nailed down! I’m hoping to get everything and be going by 4th of July weekend – hopefully the learning curve is short and we are done by the end of July. Hopefully! I’m a normal, restless american. I’ve never lived in one apartment/house for more than 4 years, and rarely that long. I’ve lived in quite a few towns and cities in quite a few states – MT, CO, SD, AK, HI, CA, back to CO, back to CA, OR, back to AK, back to HI, back to AK. I’ve worked toward college degrees in astronomy (BS attained), geophysics (PhD dropout – twice), and civil engineering (ongoing, on hiatus), at 4 different schools. I’ve been paid to be a grocery bagger, a manual laborer, a TA, an RA, a barista, a cashier, a summer camp teacher, a telescope demonstrator, a programmer, a park ranger, a child care provider, and a geologist. I’ve traveled to most of the 50 states, to most corners of Alaska (as difficult a proposition without roads), to many countries in Europe, to Japan, Mexico, Thailand and Belize. I’ve been in about 9 somewhat serious relationships (generally that category for me involves over 3 months of recognized girlfriend-boyfriend status), and a smattering of less realized ones. I’ve climbed rocks and ice, kayaked bays, summited minor peaks, rafted rapids, slid down mountains on slidey things. I’m not as cool as I hoped I’d be when I grew up, but I have to admit I’ve checked off a lot of the general experience boxes. So, one thing and another, I’ve been thinking lately, what would I do if my constraints were less then they were (family, financial, fear, and otherwise)? And I think I decided I’d do pretty much what I am doing, strangely. There are big pulls in me to live nearer family, or in a climate easier to live and grow things in without so much outside energy input. I still want to experience some things – bike culture in the Netherlands or Denmark; traditional sub-arctic living wisdom in Siberia; perhaps Africa. I’d like to learn to sail, or at least tag along on a sail boat, as a gentler means of travel. I’d like to become a better urban farmer. Someday I’d like to not sit at a desk for 8 hours all the time. I’d like to be part of intentional community, as in a cohousing or ecovillage, where my cohorts are equals as far as the living situation goes, and not as transient as tenants. But most of what I want to do I plan to do, and can do, under my current constraints – it just might take a bit longer. And I am happy and committed to my ecoplex and my life here. It helps that I chose this life very deliberately, and on my own. I often moved places for school or to be with people, but in moving back to Alaska as an adult I only moved for the place, to the ultimate death of the relationship I was in at the time. The ecoplex is also a dream that I followed only my self into. Not that I am a big fan of major, pioneer-like, individualist action. It can be hard to find yourself working cooperatively and happily next to others, when the deep conviction of the dream only belongs to one of those involved. Over time I would like to see myself, in one way or another, involved in a more tightly knit, intentional community of people, but that growth can be organic from where I am now. I change my mind a lot. I suddenly realize that the variables have changed and I want something different than I did, or I just need change, so who knows what may happen in the future. It is also easier to stay committed to Anchorage in the summer, when the weather is perfect (calm, sunny, and 70F today!) and the living is easy. But it is nice to know I am where I want to be at this moment. I’m not going to let my lack of a camera and resultant pretty pictures keep me from posting. Imagine you are seeing a pretty close-up of fresh green, classic leaf-shaped pear leaves, softly framing a cluster of dainty white pear blossoms. Picture them bouncing lightly in the breeze, and looking hopeful and expectant. Pan across the yard to the two other pear trees, probably the only other pear trees for miles. These little saplings were planted a mere few months after the first, in the fall of last year, but they haven’t quite settled in yet. They are still in shock and rebellion at being ripped out of the 50-some-odd degreeF upstate New York soil and being shoved into the freezing soil of Anchorage. Well, the soil is not still frozen. At depth it is about 36F, nearer the surface where the pear roots are it may be 60F or more, I haven’t checked it out. In any case, these two pears are just starting to have visible green, elongated leaf buds. They made it through the winter, and the painfully slow blow of the buds is observable, but they are nowhere near bloom, even if they get blooms this year. Excuse my anthropomorphizing and my personal frame, but the poor blooming pear is stuck in a season of fruitless aloneness, possible mates all being too immature to bond in a satisfying and productive relationship. Perhaps next season it will be different. But of course, the pear doesn’t mind, all it knows is that it must bloom, that there is joy in the blooming, and perhaps better to not have her (and now I have chosen a gender for a genderless or multigendered plant but it fits the analogy) thin, sapling branches bent beneath the gravid weight of succulent offspring. Really then, it is only I who mourn, in advance, the lack of any possibility of fruit this year. The pear is exultant! One of the best things about this blog for me is the log of past years it gives me. I can look back when I am feeling unproductive and stuck and see all the things I have accomplished over the past year. I can get an idea of when I planted a tree. I can check out my posts in May and see that all of last May was sunny and warm, with no rain, clouds, or wind until Bike to Work Day last May 16th, when it rained the whole day, before getting nice again. This May has been generally cloudy, windy, a bit sprinkly, and cold because of the wind. We have had a few nice days, luckily mostly on weekends, and today is one of them. Tomorrow, Bike to Work Day this year, is forecast to be lovely as well (although it was predicted to be nice last year too, before it decided to be very wet). So get on your bike and enjoy it! Take the trails if you can (always nice to avoid the cars, even if you go a little out of your way), and BCA will have quite a number of free coffee and treat stations set up, including one with bacon (?!) from the Spenard Roadhouse…check out their website (link on the side) for more info. I’m providing Bear Tooth pizza and beer to bikers at my place. Lastly in biking news, I think my boy is ready to ditch the trail-a-bike soon. The thing is getting pretty heavy, and is geared wrong for him to help much with the peddling. He is pretty fast on his old, clunky, heavy, too small 16″ kids bike, so if I can find him a little more streamlined 18-20″ one that he fits (still single speed – lets not rush the distraction of gears!) I think we can start to be co-bikers to school/camp instead of mainly mama-powered! Growing up is a wonderful thing. I have had a huge truck load of birch wood chips delivered free from a local tree trimming business, and we just drove up to Chugiak to get a nice truck load of manure-y goat bedding. We have mulched the whole front yard, planted a willow fedge (fence/hedge made of bent willow wands – I hope they root! ), paid the neighbor to lay all the cement slabs dug up in the foundation insulation as a front walk, made a hugelkulture hill of sticks, compost, horse manure, and fill dirt. Unfortunately, most of the bare areas that I am putting seeds in are fill dirt – sandy, no real organic matter, so they are dry and resist water infiltration and holding. I will mulch with copious organic matter if they ever sprout, or will work in organic matter and try again next year if they don’t. I did make two very nice and organic-matterish sheet mulch beds last fall, and I expect great things out of them – the dandelions already think they are a terrific place for plants! Most of my trees seem to be leafing out fine, even the summercrisp pear I worried over all last summer. One of the two lilac divisions saved from the dug up tree and replanted late last fall doesn’t seem to have made it, but it is more surprising that one of them is doing great! I am a bit worried over many of the trees I planted from my order last fall – the 2 pears and 4 hazelberts and some of the others look like they have some living buds and might leaf any second, but then again, maybe they won’t. Stay tuned and I’ll give a triage report of what did and didn’t make it along with pictures soon! The tulips look like they want to bloom any second, but the wild currant has beat them to the punch, being the first blooms of any sort I have noticed in my yard. Happily, my tenants are putting in gardens as well! So, the upshot is that I have killed all my bees. But I will continue my story of hiving, briefly, so you can learn all the lessons I’ve just learned, without having to repeat my mistakes. So, the things that went wrong with hiving initially generally involved my inability to get all the bees in the hive. Ways I killed bees: I crushed some to death putting the lid on the hive; I froze some to death by not being able to get them shook out of the packages and into the hives – about 1 pound of my 4 pounds each package – directions all said to leave the packages near the hive entrance and the rest would make it in, but it was too cold and they just huddled together and didn’t move; I accidentally grabbed one when I grabbed the side of the opened package and she stung me – thereby dying (the sting wasn’t that bad, and despite my bungling, the only one I got without any protective gear); I killed the rest in their hives with bad preparation. How the main mass of bees died, after hiving, is a bit of a mystery. The clues are: they were perfectly alive 3 days after hiving when I had to leave on a last minute work trip – buzzing and clinging to the top bars, queen cages had been opened and hung after a time in transit with the workers plus and extra day in the hive. 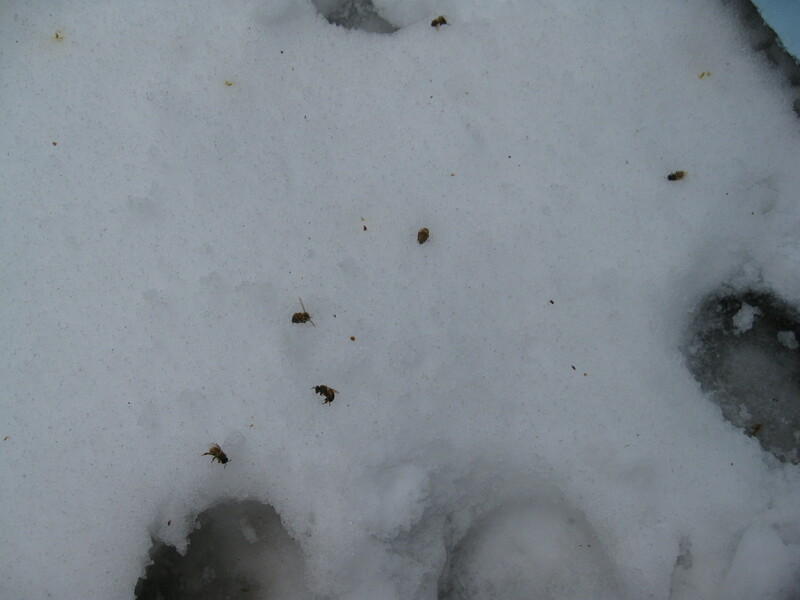 They were perfectly dead, in a very large, still mass on the bottoms of both hives upon my return 12 days later. Some sugar solution was still in the syrup jar sent with the packages and set up by me in a hive top feeder. The queens were no longer in their cages (though some dead workers were crowded up in the cages). There had been absolutely zero comb formed. There was no sign of disturbance or foul play. My best guess is that they froze to death. I think my hastily created hive-top feeders fit a bit poorly and left a gap for heat to escape the hives, though I thought I had checked for that, I was in a real rush at the end. Probably they died almost as soon as I left, since there was no comb. Perhaps I poisoned them somehow. I used gorilla glue on the hive bodies instead of elmers or something safer. I used a eco-citrus cleaner spray bottle to fill with sugar solution to spray them in the beginning, and even though it was some benign brand like biokleen, and I cleaned it out really really well, maybe… Maybe they starved to death. I placed the short box to make room for the feed can between the hive body and the quilt/roof, on top of a piece of mosquito netting and then placed the can on the top bars, in the feeder box, on top of the netting. It should have been accessible to the bees, but maybe the bars got in the way, or they were too cold to move over to it, or something. I really think I will do better next year. I have gotten some great advice on better hiving – including using spatulas and more effort to get them out of the packages and in the hive. I have gained confidence and experience in handling a writhing body of bees. One of the best suggestions was to put an empty, bar-less box on top of the hive body and set the almost empty package in there, with the quilt/roof on top and let the rest of the bees get down into the hive from there – where it is warm. I will be better prepared with boxes and feeders and such, and hopefully will not go out of town, so I can eliminate or seal any gaps, and respond to any problems. I am sad about the bees, and sad that my trees will not benefit from their pollination this year. I am also ready to try again, and sure I will do better. I will have another year of reading up and preparing, and the perfect storm of work trips (before and after arrival of the bees) will hopefully not repeat.